I regularly upload pictures to Instagram, slowly building a portfolio and a community. Though I’m a visual artist, and love looking at photographs, until joining Instagram in June, I rarely took a picture. I preferred creating images with materials I could touch and manipulate, but for some reason I’ve fallen in love with Instagram–from uploading images and seeing who likes them, to reviewing other people’s images and finding new people to follow. I posted this image yesterday and it’s popularity surprised me–of course I snapped it without thinking. The black hole, the plump succulent against the rusty metal–a juxtaposition reminiscent of Andy Goldsworthy‘s work–though I’m not comparing myself to a master of this genre! How to relate this to mindfulness? It illustrates being in the moment rather than planning the moment; and finding beauty and surprise in the mundane–though I believe less and less in life as mundane. We only think so because we view it through veils of thought and conditioning. Life continues in all its incredible complexity and glory whether we notice or not. Wake up to what’s really happening–don’t confuse the illusion of life, with Life as it really is. 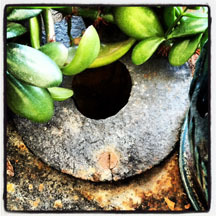 This entry was posted in Art, Creativity, Mindfulness and tagged black hole, Goldsworthy, Instagram, rust. Bookmark the permalink.